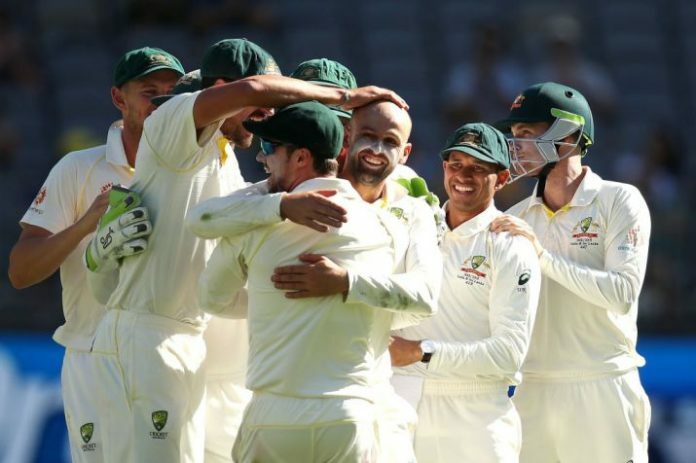 Australia on Tuesday thrashed India by 146 runs on day five of the second Test at the Perth Stadium to level the four-match series 1-1. Australia have made a terrific comeback in the Test series, winning the 2nd Test by 146 runs. Pat Cummins bags his second wicket to pull the team level 1-1. Tim Paine elated with his team’s performance. # Australia beat India by 146 runs, level four-match series 1-1! AUSSIES WIN! What a Test. GOT HIM! Cummins gets in on the act now as Ishant edges behind for a duck. # Pat Cummins comes into the attack. Mohammed Shami is the new batsman for India. GOT HIM! Short, fast stuff from Starc and Umesh pops up a simple return catch. Gone for 2. # Ishant Sharma walks down the crease to bat for India! GOT HIM! What a catch from Handscomb! A blinder hands the GOAT his third wicket of the innings. Pant gone for 30. # Umesh Yadav is the new batsman in for India! GOT HIM! Starc gets the first breakthrough this morning as Vihari edges onto thigh pad and Harris takes a simple catch. Gone for 28. # Hanuma Vihari and Rishabh Pant have walked down the crease to resume India’s second innings.Nathan Lyon will begin the proceedings for the hosts. # The fifth day’s play is all set to get underway! India were reduced to 112/5 by Australia at stumps on the fourth day’s play on Monday, still needing 175 more runs to win the second Test of the four-match series at the Perth Stadium. Chasing a target of 287 runs to win, the visitors made a worst possible start, losing KL Rahul (duck) and first drop Cheteshwar Pujara (four) cheaply to reduce to 13/2. Subsequently, skipper Virat Kohli and Murali Vijay joined forces to steady India’s ship on a difficult pitch at the Optus stadium. Everything was going fine till 41/2 before Nathan Lyon struck twice to dismiss the duo in quick successions for 17 and 20, respectively. Ajinkya Rahane and Hanuma Vihari then took the mantle on their shoulders and looked all set to bat on till the end of the day’s play. However, Hazlewood struck for Australia in the 35th over to break 43-run partnership between them and sent Rahane packing for 30. At stumps, Viharia and Rishabh Pant were batting at the crease on their respective score of 24 and nine. Earlier, resuming at the overnight score of 132/4, Usman Khawaja (72) not only struck his 14th Test half-century but also shared a crucial 72-run partnership with skipper Tim Paine for the sixth wicket to take Australia’s lead past 200 before lunch. However, India finally managed to break their partnership when Mohammed Shami delivered a nasty bouncer in the very first over after lunch to remove Paine for 37. Shami didn’t stop their and handed India another wicket by dismissing Aaron Finch, who resumed his innings after being retiired hurt on Sunday, for 25 in the successive ball of the 79th over. Shami then bagged a big wicket for India in the form of Usman Khawaja (72) in the 83rd over.Pat Cummins (one) and Nathan Lyon (five) were then dismissed in quick succession as Australia were bowled out for 243 runs to set a 287-run target for India. India XI: KL Rahul, Murali Vijay, Cheteshwar Pujara, Virat Kohli (c), Ajinkya Rahane, Hanuma Vihari, Rishabh Pant (wk), Umesh Yadav, Mohammed Shami, Jasprit Bumrah, Ishant Sharma. Australia XI: Marcus Harris, Aaron Finch, Usman Khawaja, Shaun Marsh, Peter Handscomb, Travis Head, Tim Paine (c,wk), Pat Cummins, Mitch Starc, Nathan Lyon, Josh Hazlewood (vc).